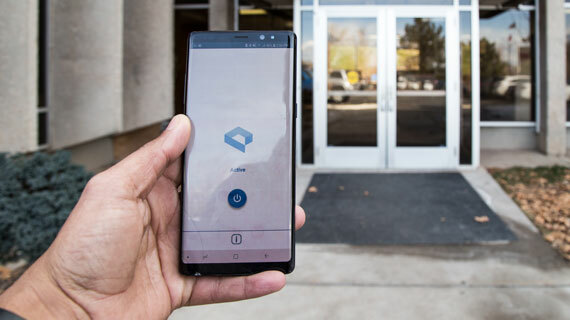 Many of the building entrances across Southern Utah University’s campus are now Bluetooth enabled to open hands-free, making campus more accessible for everyone thanks to a partnership with Portal Entryways. 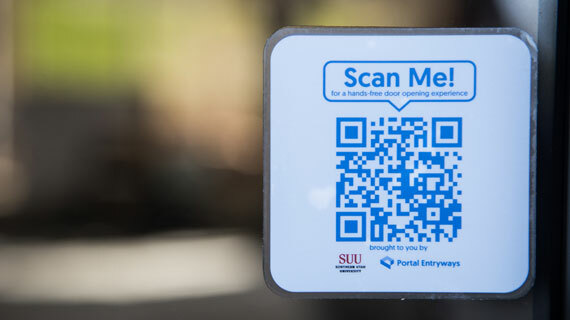 During the fall of 2017, SUU Facilities Management and the Disability Support office began working with a group of students from Brigham Young University to help develop the product for Portal Entryways (which at the time was a small startup). This breakthrough technology provides an incredible opportunity for ADA access points. "We are having more and more students using wheelchairs and having mobility difficulties, the fact that they can have an app to open doors on campus immediately, without even having to touch their phone once the app is set up, is a step forward towards universal design,” said Carmen Alldredge, director of disability services at SUU. “SUU is moving forward thanks to those who understand and are willing to improve the lives of many." The Bluetooth technology works to open the exterior door(s) automatically when a patron, with the corresponding app downloaded on their smartphone, comes within a certain amount of space from the door. At least one exterior door in most campus buildings will be equipped with this technology. “We have contracted with Portal Entryways to install 40 transceivers across campus, knowing this will make a tremendous difference to those needing assistance accessing campus buildings more readily,” said Tiger Funk, assistant vice president for Facilities Management. “We are so excited to have the Portal Entryways devices installed. This provides easier access for anyone who can’t access a door, whether it’s a person in a wheelchair, a parent with a stroller, or a student with an armful of books,” said Disability Support Specialist Christine Bonnett. Facilities Management has also committed ongoing funding for the annual contract price which includes technical support, data analytics, and future opportunities to expand the system. “Portal Entryways has created opportunities for mobility that have never before been realized by persons unable to operate building access points,” Funk continued. For more information about Facilities Management at SUU, visit their website.